The Rev. William Barber II, leader of North Carolina’s Moral Monday’s Campaign, and President of the state’s NAACP, has joined New York’s Union Theological Seminary’s’, Kairos Center to revive Dr. Martin Luther King Jr’s, Poor People’s Campaign, mortally wounded along with Dr. King in 1968. 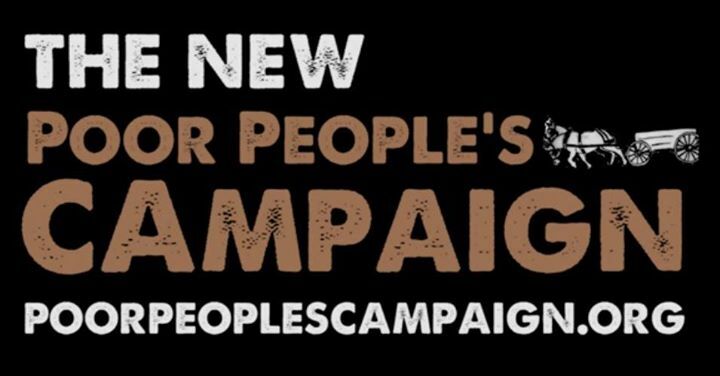 With the return of a New Poor People’s Campaign there is hope. Joining in this effort on the part of each of us can produce great returns for everything we do. It aims to be a truly national campaign that, when fully organized, will touch all 50 states. Since the onset of Ronald Reagan, nearly four decades ago, the nation has been whittling away at what at one time was a reasonably good social safety net. Reagan’s central thesis was that the nation’s ills could largely be attributed to government. Turn loose the entrepreneurial power of business, the President argued, and we’d see tremendous economic development. We have. Yet, globalist economic growth has diverse people’s all over the globe questioning just who most benefits from growth, development, and the world economies of our own time? Much of the debate in the United States has centered on how we ought to view poverty and the poor, and hopes for its elimination. The answer since Reagan has been that it is the poor themselves, and their moral failings, that produce poverty. Conveniently pushed to the side are some hard truths about our shared inequalities, rather than wide avenues of economic opportunity for advancement that used to be present and real for most Americans. The involvement of government and business in addressing poverty are of historical significance, and they remain so now. The historical record shows definitively that private charity alone is inadequate without the involvement of citizens in the public square, and of that means of addressing issues of common concern; government. FDR’s New Deal helped to meet the challenges of the Great Depression of the 1930’s. The notion then was that our nation through the instrumentality of the Federal Government had the primary responsibility for managing the economy and that Americans came to see government as a major part of the solution, rather than any sort of problem. Depression Era Americans experienced the climb out of the pit of economic disaster led by the Federal Government, World War II, and the period of U.S. global economic dominance that produced a widely shared abundance that was real. They saw and felt government solving economic problems and ensuring more widely shared equalities. Our people felt they did have a shared responsibility to alleviate the poverty that remained. Lyndon Jonson’s Great Society followed. It was a two- pronged assault on both the grinding poverty of rural America, and what were termed inner-city ghettos, along with the structural racism that existed in plain sight at the time. Heady progress was made with the 1964 Civil Rights Act, and the Voting Rights Act of 1965. Job training programs, and government interventions of all sorts were at the core of the Great Society. Johnson, in a widely quoted speech used the metaphor of the poor and oppressed people of color as being in a race, but with shackles around their ankles in the starting blocks. The historical record shows that government interventions on behalf of the poor were and are not only vital lifelines for “the least of these” that Jesus Christ spoke of in scripture, but that these positive economic outcomes returned more than what was spent. Today, as before, our economy and our society benefit mutually from efforts to aid the dispossessed. Food Stamps econometrically produce $1.73 of increased economic output for each dollar spent. There have been failures. FDR’s consumer buying program was a near total failure. This was in contrast to the marked successes of most other New Deal programs. The historical record shows us that Johnson’s Urban Renewal Program tore up vital ethnic, racial, and economically cohesive neighborhoods. The hyper racial segregation present in America’s cities spurred by racial animus, and insurance red-lining and discriminatory city ordinances remain to this day. Middle Class people of color in part moved out to suburbs of color or were racially integrated to some extent. That left sections of our cities and the poorest rural Americans in the lurch. The Rural poor have always in raw numbers been largely more white poverty, rather than just of color. Food Stamp recipients and those receiving Medicaid are overwhelmingly white people. Historically, we went from taking responsibility for poverty and its amelioration in America to pointing an accusatory finger at the very people experiencing these hardships. We have embraced a faux-austerity in historical Federal budget after budget, where massive subsidies and tax breaks are given to the wealthy and corporations. By contrast, the poor themselves face a real and cruel austerity marked by cuts to social programs and declining economic opportunities no longer produced by the market in meeting the needs of ordinary Americans. Since Ronald Reagan’s presidency, economic historians have shown that Union membership that once helped ensure family-supporting jobs, have been on a directly correlative steady decline with America’s once vaunted Middle Class. President Reagan’s real and symbolic action of firing the Air-Traffic Controllers on strike at the time of his acceding to the Presidency in 1981 has produced a societal hostility to Unions, fomented by big business that is in sharp contrast to the heady support for them that both parties adopted during the Eisenhower Years of the 1950’s. Structural inequalities in the distribution of income in our tax system, wages and salaries, have become so acute, that social historians, social psychologists, and others are warning of the unraveling of society. Most Americans now know that nearly 99% of new income growth our economy has produced since the Bush years, at the least, is being re-distributed to the top 1% of income earners. The deep injustices of these economic inequalities inevitably run headlong into long-held racial stereotypes of just who the poor are, and what their moral character is. The narrative offered is borne of racism and falsehood. Most of the poor in America have always worked for a living. They simply cannot earn enough to support themselves alone. This speaks to what are becoming historical structural inequalities every bit as daunting as those of America’s historical Gilded Age 1876-1914. We have our Robber Barons now, just as our historical counterparts did so long ago. The structure of our economy has been strangling the poor since the Reagan years of 1980-1989. It is unjust, immoral and inexcusable. The very structure of our economy now produces more beggars than it destroys. Our narrowing moral vision, and a deeply pessimistic view of our future as a people and nation threaten to undo the very social fabric for democracy and representative government. The New Poor People’s Campaign and the Kairos Center provides the sort of expansive moral vision, and an arc of the moral universe that Dr. Martin Luther King Jr. was just beginning to offer both as a critique, and solution to the economic problems facing America’s dispossessed that bends toward justice. This entry was posted in Community and Citizen Action, Essays, It's About Struggles for Justice, National Affairs, Race, The Faith Community, The State of Labor and tagged chairty, Dr. Martin Lther King Jr., government andpoverty, justice charity, Kairos Center, Liz Theoharis, New Poor Peoples Campaign, Poor Peoples Campaign, Poverty, Rev. William Barber II, Social Justice, socialjustice, Union Theological Seminary. Bookmark the permalink. Great analysis of why the “poor” are with us thanks to the workings of a growingly unfettered free enterprise system. The real tragedy is that many of the poor themselves have been brain-washed into believing that “those people” are the cause of their woes, or that those “big, bad unions” are ruining the economy, or that bureaucrats are at the source of the reason jobs are no longer around. The divide-and-conquer quest has divided the country. Lots of work to do and a renewed “poor peoples’ campaign” may be a good start.